Hörberg Productions has announced that Mechstermination Force will release on Nintendo Switch next week. 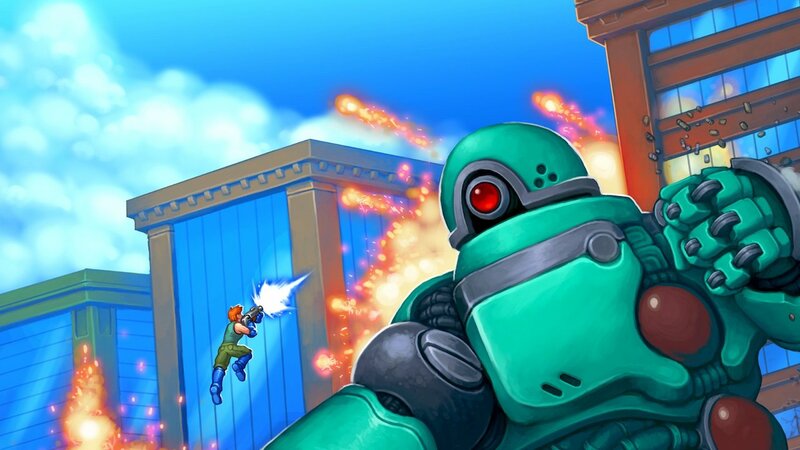 This next game from the Gunman Clive series creator is an action-packed platforming boss rush that challenges you to save Earth from the gigantic MegaMechs. The MegaMechs have taken control of the world, and it’s left to you to fight for humanity’s independence. Whether alone or in two-player local co-op, that will challenge you to topple 14 massive bosses. You must jump and climb onto them to locate their weak spots, with powerful weapons and upgrades helping you in your fight. The Magnet Gloves can be used to climb on the robots, the Boost Boots will let you double jump over pools of lava, and your trusty baseball bat can be used to smash the MegaMechs energy cores. “I am so happy to finally be able to share my next title with the world, I see it as the crazy lovechild of Contra and Shadow of the Colossus,” enthuses Hörberg Productions director Bertil Hörberg. Mechstermination Force will release on the Nintendo eShop for Nintendo Switch worldwide on April 4th, priced at £10.99 (€11.99/$11.99).